Around the 80s, Alfredo De Marini was struggling to save his son, Davide. He took him to all the doctors in Italy and not only, he moved seas and mountains but, unfortunately, the disease was invincible. In the same years, also in Fano, another boy, Francesco, a few years younger than Davide. Another family, the same tragedy. In 1989, after David’s death, Alfredo decided to dedicate his whole life to the struggle for Ataxia Telangiectasia (AT) with the hope to help other children. 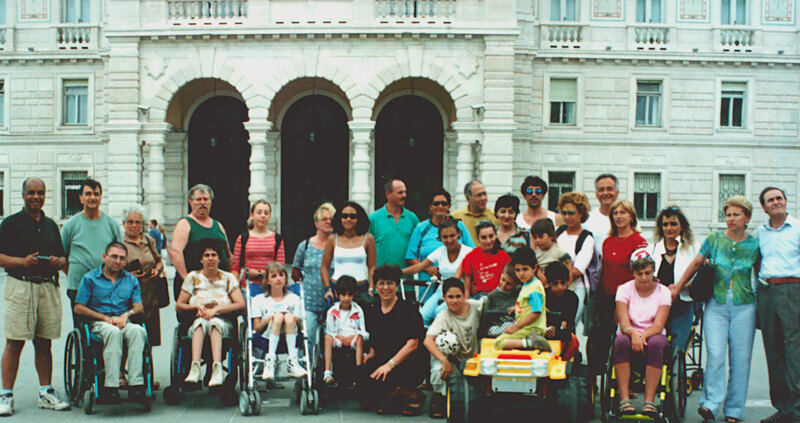 Thus, in 1994, a group of twenty-two founding members from Fano and not only, went to Rome to found the Association Ataxia Telangiectasia “Davide De Marini”. Because the National Association AT Davide De Marini was the first in Italy, it was conferred to it the title of “national”. 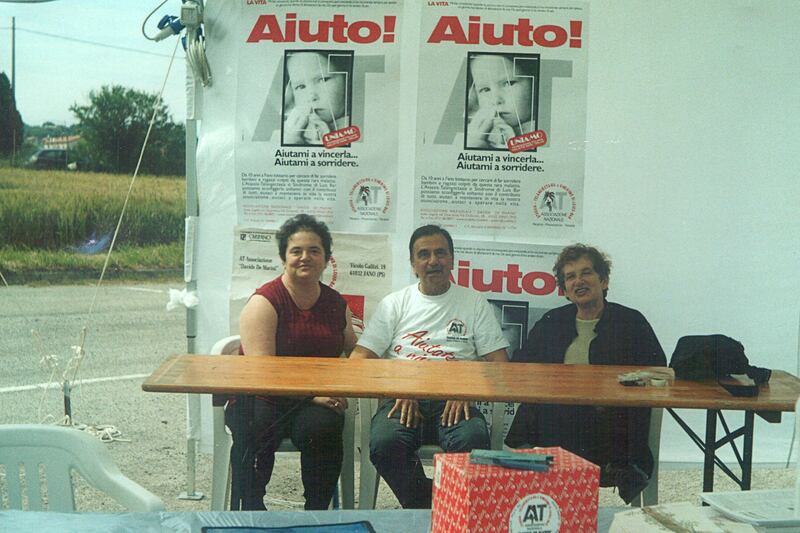 Faced with the initial disavowal of the disease by the competent bodies, Alfredo decides to undertake a campaign to collect signatures so that the AT would be recognized as Rare and Invalidating Disease. And this is how, together with the people who had joined him in the struggle, over 17,000 signatures were collected throughout Italy, which were then cataloged and presented to the Ministry of Health. Later, Ataxia Telangiectasia was included in the Register of Rare Diseases. In the same year was identified the responsible gene for the disease: the ATM gene, the M-utated gene in AT due to a team work during the years, which also involved a geneticist from Rome, Luciana, who appeared among the founding members of our association. 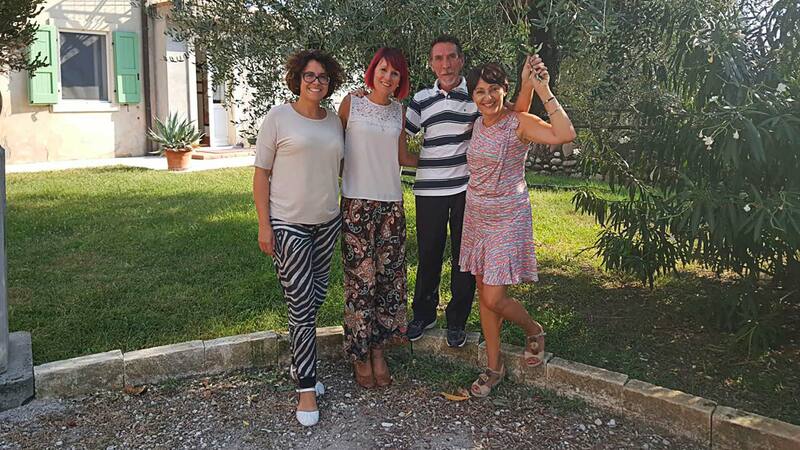 During the first years, Alfredo was keeping in touch with a new family from Turin, Mimma and Rossano and their Valentina, and together they undertook numerous and important initiatives. Since then, various associations have been established over the years at local level to continue and fight against AT in the countries and among the people. In 2000 “Gli Amici di Valentina” in Turin, in 2004 “Noi per Lorenzo” in Verona and finally in 2007 a “Vero Sorriso” also in Turin. There were many works managed by various organizations that today, together, have given life, or rather have reincarnated, in the “new” National Association AT. After different negotiations started in 2016, in 2017 exactly the association “De Marini” was reborn to National Association AT (NAAT) due to the insertion of new forces through the inclusion in the board of eleven families dispersed on national territory. Now the AT fight is national again. The collaboration with Alfredo De Marini dates back to 1995 with the signature collection. After that, our work has been extremely important to give to families the opportunity to accede to all the opportunities provided by the law 104: exemptions, disability and other, in order to face the disease in the best possible way. The beginning was full of hopes and enthusiasm, we were convinced of many initiatives, along with friends and other families. WE WANT to try to build a way to treat our children but there was nothing that was known to help them. Since the Association “Gli Amici di Valentina” appeared, there have been many events, shows and families and researchers meetings, there have been built relations between national and international associations. From 2002 till nowadays, the Association has actively supported both diagnostic and research activity of the Medical Genetics laboratory of Prof. Alfredo Brusco from the University of Turin. In these 15 years of diagnostics, Prof. Brusco’s laboratory evaluated more than 100 cases with suspect to AT, performed differential diagnosis for Oculomotor Apraxia of type 1 and Type 2, performed molecular analyzes on the carriers in the preconception period. Within the diagnostics, particularly important were the prenatal diagnosis carried out from 2005 on 10 families with affected children. Other research projects financed at the Universities of Naples and Rome due to the collaboration with Prof. Claudio Pignata and Luciana Chessa, respectively. Also in 2002 the memorable meeting of the families in Lignano Sabbiadoro in collaboration with AT Davide De Marini, where for the first time was organized a 5-day tour with the families where it was possible to express so many doubts and perplexities and, for the first time, we talked about oxidative stress and the use of vitamin E and folic acid, and also stayed together smiling and having fun, and then “All Together in Trieste” to enjoy a beautiful trip. In 2004 in Luxembourg together with the French APRAT, where we met the European families and made close contact with some of them. In 2008 in Turin, with the French Association and AT English Society and related researchers and many others, to create a cohesive and strong group able to understand the disease implications. Among many of the events full of emotions, one of them was full of meanings, which allowed us to expand more the knowledge of the disease. The collaboration with DUCATI, Valentina’s passion for motorbikes, brought us to meet many wonderful people and Dr. Minoli was one of them. We were invited to Mugello, we met Capirossi, their pilot, very sweet and collaborative person, Valentino Rossi surrounded by fans but, who found time for her. Our T-shirts have been printed with the Ducati logo, which made a long tour around the world and were worn by many people. A very important project was DISABLED and SPORT carried forward, convinced of the fundamental importance of including the disabled people in the sporting environment (there was still no talk of para Olympics). Another important step was the Project “Globulo Rosso” namely the possibility to infuse dexamethasone through the red blood cells due to the collaboration with Erydel, which marked a big step forward in the treatment of the AT and today is in the third phase. In 2017, started a collaboration with IFOM Institute for the development of International Workshop in Milan, contributing financially for the development of the conference. As foreseen by the Statute, during our activity we have supported financially some Families in economic difficulties . We are grateful to the life that Valentina gave us – tells Domenica Romeo, for everyone Mimma – she was a person who enlightened our life, living hers. All the children affected by Ataxia Telangiectasia have the ability to activate the best in people who know them and together want to build a better future. The Association Noi per Lorenzo was established in 2004. After discovering that his son is suffering from Ataxia Telangiectasia, taken a bit by despair Daniele and Silvia confided in friends who are the parents of Lorenzo’s classmates, not letting them feel alone decide to organize a football game between parents and children and was invited also the team which won the historic championship of Hellas Verona. At that moment there was no question for the collected funds (it was a scanty amount), rather in the presence of the people who supported and encouraged us in the beginning of this hard way. Daniele and Silvia on that occasion see a hope and decide to do everything possible to sensitize the local public opinion of this rare disease and to influence the pharmaceutical companies and research centers not to leave these children and their families alone. From there started events and interventions in transmissions which showed in the city and province, mainly thanks to people, journalists and friends who did their best to support this cause. In the next years there have been collected funds that allowed to support financially some of the doctors who have been studying this syndrome for a long time, such as Dr. Luciana Chessa from Sant’Andrea from Rome and Dr. Pignata from Naples. Workshops between doctors and researchers and families of the patients with AT were sponsored to enable both groups to create a circuit of information useful for everyone to research and support the daily difficulties of the families with AT. A great importance had the last project Noi per Lorenzo, which due the collected funds managed to support the research carried out by IFOM center from Milan in the person of Dr. Vincenzo Costanzo. Up to the present moment, we are proud of what have been done due to the involvement of families and doctors, another of the projects Noi per Lorenzo: National Association AT.